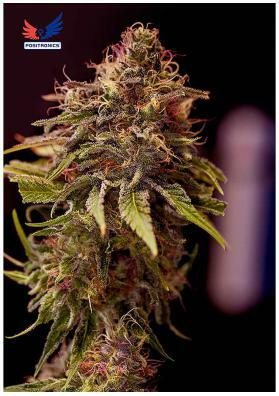 Black Widow is a indica-dominant (almost pure) Marijuana strain with a distinctive minty taste. Its high content of CBD makes it one of the best strain for medicinal puposes. Highly relaxing, sedative and introspective. Black Widow is a indica-dominant (almost pure) Marijuana strain with a distinctive minty taste created by crossing White Widow Misty and two Indicas of remarkable behavior. Its high content of CBD makes it one of the best strain for medicinal puposes. Its effect is very sedative and soothing, highly recommended to treat several ailments. However, and if you use it for recreational purposes, be sure to do it late in the day and with the aim of ​​relaxing since its effect will make you enter in an introspective and contemplative state that will be hard to get out. Due to its intense floral aroma with earthy and menthol touches during the flowering phase, we recommend to use carbon filters for indoor crops. The plant is robust, tough, dense and highly branched with short internodal distances and with some outstanding black green leaves - hence its name. It also produce huge amounts of very hard buds, difficult to surpass, making this strain to be very appreciated by commercial growers. This strain is usually quite resistant to pests during te entire time although in the last period of the flowering it does not tolerate moisture well, nor tolerates the excess of fertilizers. Besides that, in hydroponic systems it is recommendable to not exceed the EC from 1.6. It you plan to give it a medicinal use, grow it under an organic farming regime. If you want to potentiate its resin production, we recommend you to keep it in the dark, 2-3 days before collecting it. In a growing room the plant does not exceeds one meter high and after 55-65 days it will offer you amazing yields of 400g per square meter. In the outside the plant can reach heights of up to 2 meters, with productions of about 300g per plant to be collected in early October.